This Arduino shield is a complete GMSK mode D-STAR modem that can be used on a PC or Raspberry PI connected. The modem supports hotspot and repeater functionality in half and full duplex mode. The radio get connected to the present (mini DIN) 9600 bps packet connection. Built around two major components: GMSK modem chip (CMX589) and controller ATmega that takes communication to the host (PC or Raspberry PI). 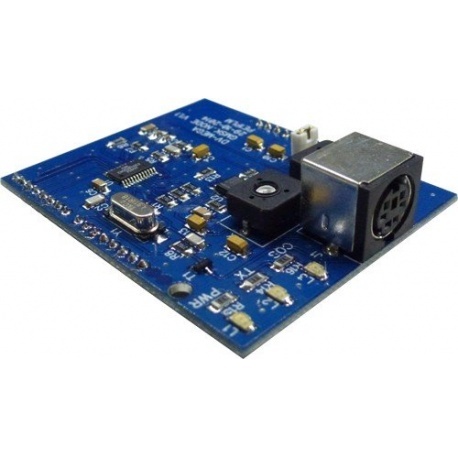 Description: This Arduino shield is a complete GMSK mode D-STAR modem that can be used on a PC or Raspberry PI connected. The modem supports hotspot and repeater functionality in half and full duplex mode. The radio get connected to the present (mini DIN) 9600 bps packet connection. Built around two major components: GMSK modem chip (CMX589) and controller ATmega that takes communication to the host (PC or Raspberry PI). - Fits on Arduino UNO and MEGA 1280/2560 - Standard mini Din /ps2 9600 packet connector - half and full duplex mode support - Complete assembled Documentation : http://dvmega.auria.nl/AMBE3000_shield.html This material does not have the CE marking and must be used only in the context of experimentation in the Amateur Radio field and in compliance with applicable local law and regulation.